It has only been a month since the drama began to unfold over at Foxconn where several “serious and pressing noncompliance” issues were found. While Brazilian workers have already threatened protest over the conditions of their factory, Chinese workers have a bone to pick as well. The Information Centre for Human Rights in Hong Kong states that approximately 200 workers at the Wuhan factory expressed dissatisfaction with wages and workplace conditions by threatening to jump off the factory’s roof. The chief complaint was workers earned less in Wuhan than at their previous jobs. Simon Tsing, a spokesperson for Hon Hai Precisions, which publically trades as Foxconn, said it was not a strike and no one was hurt. He would not elaborate as to exactly how many employees were involved but insisted that they were workers that were new to the plant who disagreed with certain workplace adjustments. "The dispute has already been settled after some negotiations involving the human resources and legal departments as well as the local government," said Tsing. Do the workers not know what their pay is going to be before they start working?? Sounds like they were already Foxconn employees who were transferred to the Wuhan plant and received a reduction in pay when they got there. "...workers earned less in Wuhan..." "...workers that were new to the plant who disagreed with certain workplace adjustments." Did you spend your whole day researching on this topic? I'm sure they knew ahead of time that they were going to get a pay cut. This whole "we're going to jump and crater the parking lot if we don't get what we want" move is as bad as an ex-girlfriend threatening suicide if you don't get back with her. It's a control mechanism, and a childish one at that. It's their choice to do it. If they do, then they were obviously mentally unstable and were going to off themselves at the slightest provocation anyway. Since they didn't, then it shows that they are using mind games to get their way. Why not just go on strike if they don't like their pay? Or, better yet, get a different job. It's a 2-way street. Foxconn might not have the best working conditions or pay, but it's the employee's choice to work there. The animals are extorting Foxconn. Let them jump. Plenty of chinks where they came from. Hey Republican, can you refrain from making racist comments in public. After the Jeremey Lin situation, people are taking the c word out of their vocabulary. I think it's safe to assume, given his name, image, and overblown language, that he's attempting some form of satire. There's no excuse for making racist comments in public. ESPN fired or disciplined its employees over the C word. Of course there isn't and I condemn him too. I was just pointing out that this is what some people consider funny. It's really sad. sometimes i think its Taco in one of his fake accounts making a sad sad satire... then i realize hes not smart enough for that. There goes, droid moron will start commenting against apple here. Here we go, apple fanboy who doesn't realize that his company is hands down the most profitable technology company right now sitting on so much cash they don't know what to do with it yet they can't pay the workers a little more. 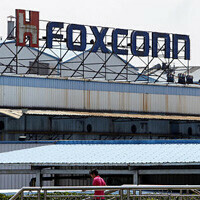 Obviously foxconn supplies other companies as well, but there's a reason apple is targeted. It may be a good idea for Dell, Apple, HP, Sumsung, and the rest of them to abandon Foxconn for a different manufacturer. I wonder if the bad press like this is worth the profit margins. But that also makes me think...if these big electronics companies abandon Foxconn, what happens to the workers? By no means do I think any job is better than no job...especially if thoughts of suicide occurs. But where will they work if these big companies went to a different company for their manufacturing? Also...to play devil's advocate...what if things aren't that bad, but employees see that everyone is paying attention and want even more out of Foxconn. Again, I usually think the best of people and that their intentions are good...but all of a sudden the spot lights on you...wouldn't you demand a raise even if your pay was decent? ...it sounds like I'm against these workers and I'm not. I actually believe them over the folks who say it's not that bad. But I always want to think of alternatives to any story. Well, the way it's 'supposed' to work is that the extra demand placed on whichever factory operator(s) the manufacturer(s) decide to go with would then need more workers thus hiring the displaced Foxconn workers. I think you're 2nd paragraph is the best argument against your 3rd paragraph. Suicides. They've actually had suicide attempts and even suicides. Sure there will always be the Greedy Gus making the money grab, and yes people even tend to commit suicide on their own. But, these suicidal gestures are a direct result of working conditions and compensation alone. The PR teams keep trying to downplay the number as less than suicide numbers elsewhere, but none of them seem to be taking into account those numbers would include other kinds of troubles, family & home life and such. These are people attempting suicide at work, because of work... not in their garages and basements. interesting theories jeff, but you have to remember this is china. where workers have zero rights and the internet is extremely controlled. The likelihood of these workers knowing that the rest of the world is paying attention is probably pretty slim. The last time workers climbed on the roof and threatened suicide, Foxconn sent the HR team up there to promise them severance if they came down.. which was a lie. When they got down the government was there to arrest every last one of them and lock them up for undisclosed amounts of time. They were also permanently blacklisted from any work in the area at all. To hear Foxconn openly say they brought in HR and the government again is very disheartening. This isnt america. This is china. These people wish they had what the whiniest american workers had... rights. Whiniest workers? I think that's a terrible characterization of American workforce. Yes the U.S. is progressive yes we have rights and people exercise their right of speech when those rights are infringed upon. Granted it is not as bad as other places. Are you saying if "our" standards aren't upheld then people should be quiet be happy it isn't conditions like China. JobsI worked in college days: I had co workers who would work 120 in a two week pay period and receive 85 hours on their check. I have seen managers force workers to work 6 and 7 of an 8 hour shift before they were granted lunch; where legally a maximum of 5 hours is allowed before lunch is required. So yeah as an American Worker I am thankful for the strides and sacrifices made during the development of labor laws. I enjoy the benefits of today's labor laws and I know that someone before me sacrificed to gain them and in return I won't allow mine rights to be infringe. Reading is fundamental. He didn't say American workers are whiny. He said they wish they had what the whiniest American workers had. You've got to be kidding me if you haven't heard some lazy, spoiled worker complaining on the job. That would be the people remix was talking about. thanks roscuthiii for pointing that out. Yes, I was specifically talking to the lazy whiney american workers that do little to nothing, complain about it, then demand the government make their lives better. Chinese workers wish they could do that. The punishment in their country would be so swift and harsh they would never think of such things. Whiney American workers (again, im american) can do such things because we have things like the Constitution and the Bill of Rights that protect us and give us the ability to do such things. They are whiney because they have no idea how good they really have it. What we call "the poor" in america is the middle class in most countries. Go to China and ask "the poor" there if the government gives them free food, clothing,housing, cell phones, cable TV, on and on and on. They would think its a horrible joke. People that turn a blind eye to these people's working conditions come from the ignorant position of "why dont they just get another job, or complain to someone". It doesnt work that way there. They will get fired and permanently blacklisted from any job in that area, or worse, arrested for speaking out against their job for any amount of time the government so chooses. And something tells me they dont get cable TV in their prisons like we do here. Actually.... The workers have plenty of rights. The rights are just ignored by officials once the officials get paid their fee to ignore the worker's complaints. the workers in china have no rights. China has one of the worst human rights records in the world. This may just be me... but they would commit suicide for better pay? Why not burn the factory down? Or sabotage it in some way? Threatening to end your life for a job just doesn't seem like the smartest way to go. Not one bit. Good point. Maybe that's why apple refuses to manufacture in the US, someone would either burn it to the ground or come to work with a couple assualt rifles after 1 month in that hellhole. Burning the factory down would have them treated as insurgents and they would disappear into the Chinese gulag where they would be water-boarded and ultimately executed for crimes against the state. Their organs would be harvested and their family would be charged for the cost of the bullet that was used to execute them. Committing suicide draws attention to the employer and the partners of the employer (aka Apple). Think back to what caused the last round of compliance audits. You don't really think that Apple would have launched the audits in the absence of suicides, do you? Suicide means no pay. Just quit for crying out loud. These Foxconn employees aren't stupid. With all the negative publicity the factory's been getting ,they have these executives by the balls.